The long rumored high gain Wilson amplifier has just been announced. The Wilson 801280 AG Pro 75 Adjustable Gain amplifier has a massive 75dB of gain, which makes it the most powerful consumer cellular repeater by a large margin. 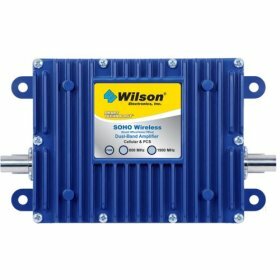 With that kind of gain, we expect the Wilson 801265 to cover 20,000-30,000 sq ft of coverage. It should therefore be ideal for huge office spaces, warehouses and outdoor areas such as campgrounds or ranches. It looks like the displays on the front of the 801280 have small dials on, which show the gain that the amplifier is currently supplying. It is unclear whether this is the automatic gain control seen in other Wilson kits, or whether there is also a user-defined gain level on top of that. The display will certainly make installation easier, as any reduced power output due to feedback can be seen immediately. 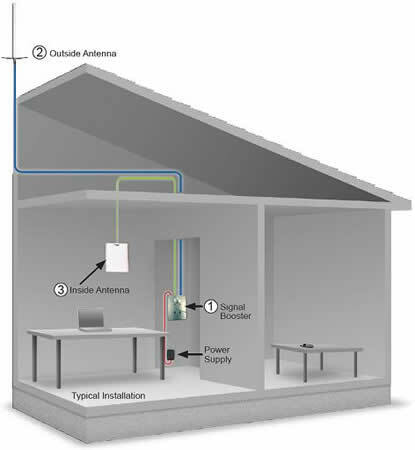 This will allow installers to adjust the antenna location and direction, to get the most out of the AG Pro amp. As they have with previous kits, Wilson Electronics may package a kit together with a standard set of antennas and cables. This will almost certainly be called the Wilson 841265 AG Pro 75 kit and will probably have 2 exterior yagi antennas and a number of internal antennas. However, as the Wilson 801280 is so powerful we expect that most customers will prefer a kit customized to their exact situation. If you have an area over 10,000 sq ft to cover, then we recommend you contact us using this form. The Wilson 801280 AG Pro 75 Adjustable Gain cellular amplifier kit significantly improves the performance of your cell phone or cellular data card in small office/home office applications. Its advanced technology is designed to significantly improve voice and data signal quality and reduce disconnects and drop-outs. It features the same patented Wilson Smart-Tech technology found in all Wilson amplifiers. This technology automatically reduces gain, preventing oscillation and keeping your kit working. Will this unit worki in 32 foot long r v.